There’s always someone who wants to cast even further - for those guys we developed Forty Plus Expert. ­It's like the Forty Plus… just longer, with a 45 foot long head. By increasing the head length, whilst maintaining the same head weight the whole cast is smoother, allowing expert casters to carry more line in the loop and with a little effort, send a fly to the next county. The use of Power Core, helps reduce energy loss and smooths out wobbles that ultra high line speed can put into regular ’stretchy’ lines. Ridge running lines reduce tangles and improve shootability. 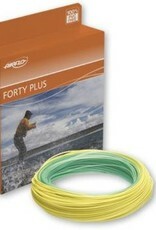 A new addition to the range is the Forty plus expert 'Booby line'. Originally designed for long range bank fishing on concrete bowl type reservoirs – this line gets the distance and drops the flies quickly to depths of 30’ or more. Head is 55’ long and is designed to be cut to length, it has a Di8 sink rate and would need to be cut to 40’ or so to work on a 7/8# rod. 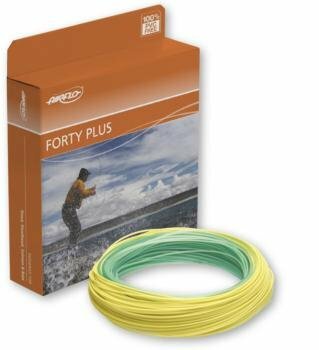 An ultra thin running line is ridged to reduce tangles and its hi vis orange colour is great for seeing takes – the total line length is 55yds. An essential line for any competitive fly fisherman. Back by popular demand for Winter 2015/2016: The original clear fast intermediate! Available in WF7 and WF8 only with traditional core.